• Holds kids up to 40 lbs. Fisher Price Deluxe Infant-to-Toddler Rocker It's a reclining infant seat with a fold-out kickstand-great for feeding baby. 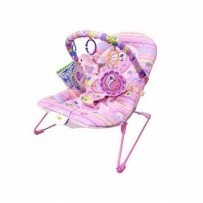 Adjust the seat upright so baby's movements create rocking motion-with stimulating toys and music to enjoy. For nap-time, you can remove the toy bar and switch on calming vibrations. And as your child grows, it becomes a toddler rocking chair for children up to 40 lbs! Other features include three-point restraint to hold baby securely in place, two-position seat recline and removable, washable seat pad. Requires 1 D battery (not included). Includes two button-cell batteries for toy operation.